This international conference will bring together academics interested in the development of Literary and Cultural Studies (LCS) in Europe and beyond, as well as policymakers at European and national level. The language of the Conference will be English. First set up in 2007 by the European Science Foundation Standing Committee for the Humanities, Cultural Literacy in Europe ran as an ESF-COST synergy 2009-2012 including international interdisciplinary workshops in four areas of LCS research – Cultural memory, Migration & Translation, Electronic textuality and Biopolitics, biosociality and the body. The initial two outcomes were an ESF-COST Science Policy Briefing, published in January 2013, and a volume, From Literature to Cultural Literacy, coedited by Naomi Segal and Daniela Koleva, published by Palgrave Macmillan in July 2014. No longer restricted to studying manuscripts, printed books or other language based genres in a philological mode, LCS researchers are now concerned rather with four essential conceptual elements, using them to describe, analyse and evaluate what may broadly be called the symbolic dimension of humanity’s relationship with material reality: textuality, rhetoricity, fictionality, and historicity. These concepts both represent crucial structures and processes at work in cultural objects and at the same time offer key techniques for understanding them. Working often together or in comparative engagement, they indicate ways in which all knowledge, all social activity, can be read. 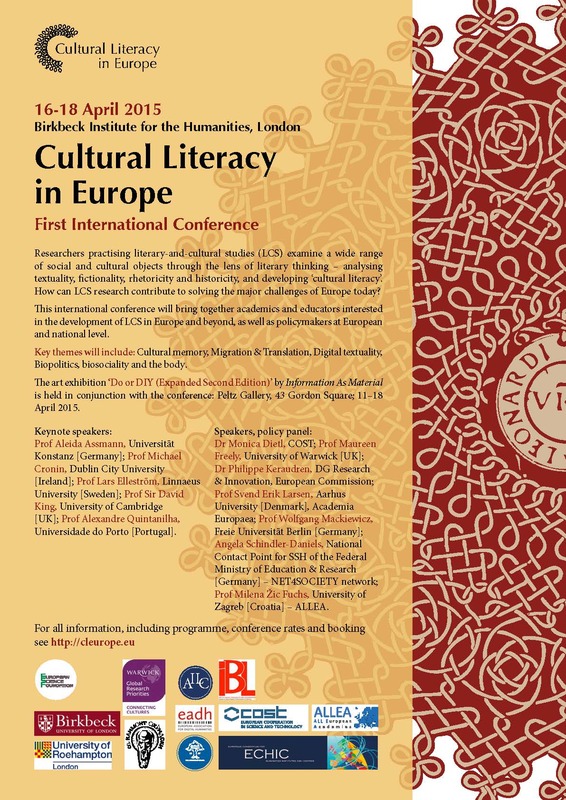 Cultural Literacy in Europe is endorsed by several partners: ESF, which has funded the project since its inception, the Birkbeck Institute for the Humanities, hosting the first conference, as well as the Academia Europaea, ALLEA, COST, EADH, ECHIC, ICLA, Sofia University, University of Roehampton and Warwick University’s Connecting Cultures Research Priority Programme. If your institution wants to become a partner, please contact us. Please send queries using the contact form.